Discussion in 'Cross Country, All Mountain & Trail Riding' started by DRB, Aug 29, 2005. Its pink (which is the new black) and has two different size wheels. Brown says he really likes the handling characteristics of mountain bikes with 700C (aka 29in) wheels, as well as the superior ability of the bigger wheels to roll over obstacles. But he prefers 26in wheels for their light weight and quicker acceleration. To get the best of both worlds, then, here's the 69er, with a 26in rear wheel and a 29in up front. The new machine also boasts some innovative sliding dropouts, avoiding the need for an eccentric bottom bracket to provide chain tension adjustment. Brown says the 69er will likely be a 2007 model year item in the Trek range, with Maverick fork and a standard rear hub with special cog guard/spacers. And yes you are welcome you freakin' wacko singlespeeders. there is just no way in hell i am riding a pink bike...it just aint gonna happen. it does look interesting though, i wonder what the 2 different wheel sizes is supposed to accomplish. I wonder if he had that at SSWC? I'm pretty sure he was riding something pink, but I didn't bother to look too closely. The pink was a one off job for Travis, here is the production version. Is that photo 'real' or just a computer model? I like the thru-axle rear dropout (if that's what it is). Well, that's an entirely different dropout system, but I assume if they weren't using it on there, it's not on the production model either. Oh well. Yeah, no doubt. 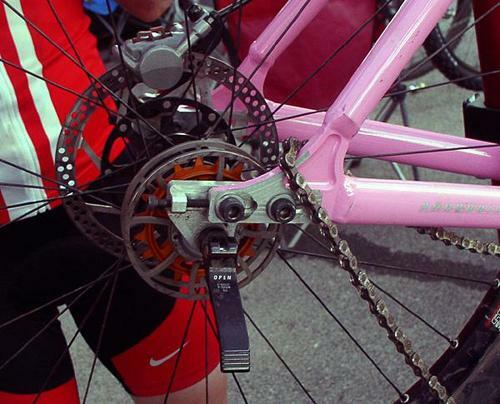 I was looking at the front chainring which didn't appear to be there under the chainwheel cover, and the chain which also vanishes as it goes behind. Thanks for the 'real' pics. The bike looks sweet. Here's one situation where it makes sense to run a tubeless setup which would mitigate against that mild annoyance. You'd just carry a 26" tube and make it fit. I recently used a 20" tube in a 24" wheel because it was all I had left that held air. It was hard to get to stay in the tire while I was seating the bead but worked fine after that. Trek has "niched" itself into a corner on this one. A small wheel/ big wheeled front bike has been done several times in the past and usually the results are the same. I won't get into that, but as you know, there weren't many examples readily at hand to point to before this. Trek has a list of $1650.00 on this, if my co-worker is correct. ( She is the buyer at the shop I work at) That's some tall coin for a bike that you might not be sure about, and cannot be anything other than it is: a single speed with two different sized wheels. Trek might have re-thought this and allowed for the installation of a separate drop out for gears and also provided room to make it a full on 29"er if you desired to. Then the sales of this bike would make more sense to me. Oh well, we'll see how it goes, but I'm not holding my breath for an '08 version like this! C'mon Specialized won't build a 29er, but Trek will build this? Kudos. Anyone ever check out Carver.They have been making 26/29 combo bike for a while now.Pretty cool.A mech at my lbs has one and swears by it.I think bikeman.com carries them.Check it out. I'm actually hoping to build a 96 soon...insprired by the carver of course! A surly 1x1 just may be my platform of choice. I think a 69'er type setup takes most of the negatives out of a regular 29'er while still keeping some of the benefits. At Pedrosfest a few weeks ago, I rode a Carver 96'er rigid SS, just because I could, and I really liked the way the 96'er accellerated and cornered. The 29" rigid front gave the feeling of maybe 2" of travel and with the larger contact patch and larger rolling diamater made rolling up and over things easier. I wasn't impressed with the tires, I think it was Exiwolfs, but it was also pouring down rain when I rode the bike. All in all, I liked the 29 front and 26 rear. I'll have to ride a full 29'er to check out the difference, but for now, I am impressed with the 96'er.